Astell & Kern AK300 is more affordable hi-res player | What Hi-Fi? Don't expect it to be cheap, but the latest addition to Astell & Kern's 300 Series of hi-res music players should be more affordable than the step-up AK320 model. And there's an intriguing new Recorder module, too. Astell & Kern has been making seriously capable portable music players for a good few years now, slowly but surely offering a machine for every step of the price spectrum. The new AK300, which officially launches at the High End Show in Munich this week, sits beneath the AK320 (£1500) and AK380 (£3000), and we're told is likely to come in at around the £700 price mark. This player will effectively replace the AK100, which is now a few years old, and sit just above the entry-level AK Jr (£400). 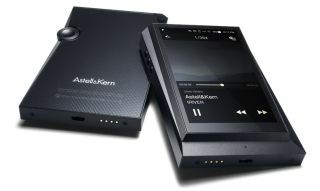 The Astell & Kern AK300 sports many of the features seen on its siblings, supporting 24-bit/192kHz hi-res audio, DSD files (albeit converted to PCM), parametric EQ and DLNA wireless streaming using the AK Connect app. It uses a single AK4490 DAC, as opposed to the dual DACs on the more expensive models, and also has the ability to function as a USB DAC. The AK300 can connect to all the Astell & Kern modules made for the existing 300 Series, including the Amp, CD-Ripper, Cradle and now Recorder. The Recorder turns any A&K player into a portable music recorder that's capable of recording analogue and digital audio, thanks to dual mini XLR/AES inputs and a 3.5mm mini jack line input. Just slide your player into the module to connect. It can record up to 32-bit/384kHz audio, with support for WAV and DSD formats. There's no official word on a price for the Recorder as yet, though one US retailer is quoting $900. Full details of the new products are on the Astell & Kern website.